Thanks to the Soviet-style system of police control and the revolutionary changes since 1989, international mobility from European communist states is probably the best documented social phenomenon of this kind and a unique experiment in the limits of state control. 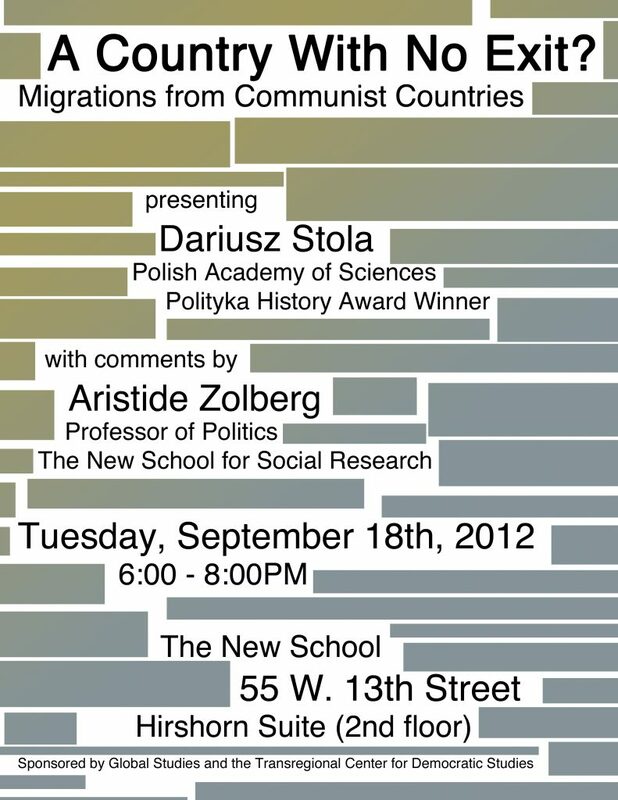 Dariusz Stola will discuss the evolution of migrations from communist states as they evolved from multi-million population movements of the 1940s, to almost nil under the non-exit policy of the early 1950s, to reemergence and expansion of international mobility, especially within the Soviet bloc, since 1956, and mass outflow to the West in the 1980s. He will shed light on the key factors and collective actors involved in the migration process and the social networks, informal communication and dynamics. Dariusz Stola is a historian, professor at the Institute of Political Studies, Polish Academy of Sciences, and fellow at the Center for Migration Research, Warsaw University. He has published eight books and more than a hundred articles on international migrations in the 20th century, the communist regime in Poland, Polish-Jewish relations and the Holocaust, as well as on Polish debates about these pasts. His most recent book A Country with No Exit? Migrations from Poland, 1949-1989 received Poland’s main book of the year award in history and is the first comprehensive monograph of international mobility from any communist country. Comments provided by Aristide Zolberg – Walter A. Eberstadt Professor of Political Science at The New School for Social Research, and director of the International Center for Migration, Ethnicity, and Citizenship. Zolberg is the author of many books; his most recent works include Escape from Violence: The Refugee Crisis in the Developing World (co-authored with Astri Suhrke and Sergio Aguayo); A Nation by Design: Immigration Policy in the Fashioning of America, and How Many Exceptionalisms? Explorations in Comparative Macroanalysis. 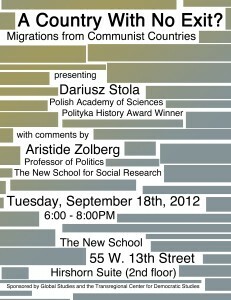 Sponsored by Global Studies at The New School and the Transregional Center for Democratic Studies at The New School for Social Research.